Se borrheic dermatitis has several different names and differences in spelling. While seborrheic is the common US spelling, in Europe an “o” may be added to make “seborrhoeic” dermatitis. Seborrheic eczema, seborrhea oleosa, and pityriasis capitis are other names for the same condition. Diagnosis of this condition is generally straightforward, but the differential diagnosis includes a variety of conditions, such as psoriasis vulgaris, atopic dermatitis, tinea capitis and candidiasis, as well as other, more rare conditions. Seborrheic dermatitis is first and foremost a skin condition, but it can also involve temporary hair loss if the dermatitis is located on the scalp or other terminal haired skin areas. The dermatitis shows up as scaly inflamed skin which can be itchy or painful to touch. This is an inflammatory condition the cause of which is not well understood. It seems that the sebaceous glands attached to the hair follicles begin to produce a very rich form of sebum. The sebum contains fewer free fatty acids and squalene but increased amounts of triglycerides and cholesterol. The trigger for this is most likely androgen steroid sensitivity. Times of hormone fluctuation, such as during puberty, can activate the onset of seborrheic dermatitis. Seborrheic dermatitis can also be observed in some new born babies when maternal androgens are passed from the mother to the baby across the placenta. The exact cause of seborrheic dermatitis is not known but there is probably a genetic component involved. The prevalence of seborrheic dermatitis changes in different locations and communities around the world. The most susceptible ethnic group are Caucasians and people of Celtic descent in particular. People with Parkinson’s disease are also very susceptible to seborrheic dermatitis. People with Parkinson’s disease produce very high levels of of sebum. This can be partly improved by patients taking L-dopa supplements. The excess rich sebum production in seborrheic dermatitis can trigger the proliferation of skin flora. Yeast Pityrosporon ovale (also called Malassezia furfur) has been shown to gradually increase in numbers with the intensity of seborrheic dermatitis. This excessive yeast proliferation may further be a cause of irritation and inflammation. Although all this inflammation is not specifically directed at the hair follicle, if hair follicles are in the vicinity of the inflammatory cells then they can still be adversely affected. Hair follicles find inflamed skin an unhealthy environment in which to grow. 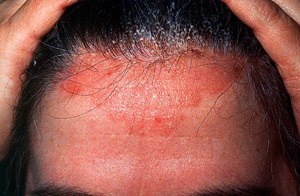 Thus seborrheic dermatitis may non specifically cause hair loss. This hair loss should be reversible with reduction of the inflammation intensity.